﻿ Emerald Coast Gator Club -- Fear the Gulf! 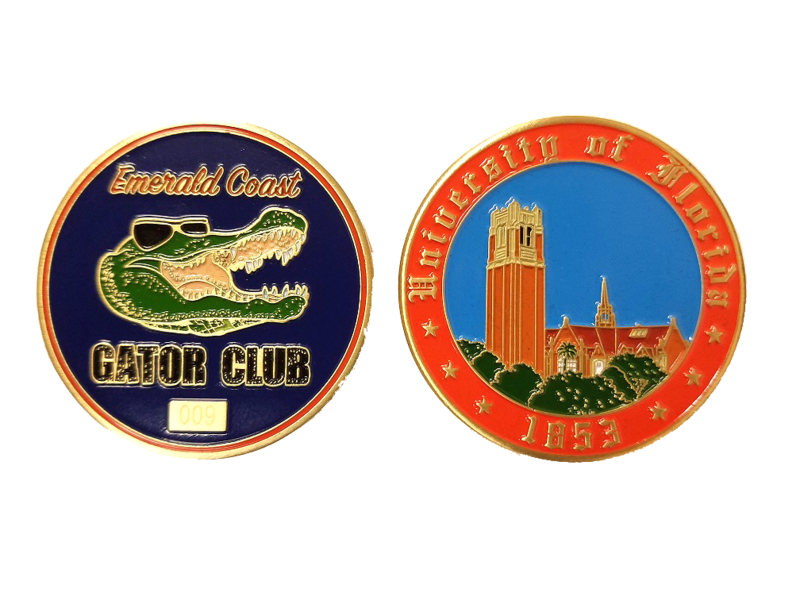 The Mission of the Emerald Coast Gator Club® is to foster and enhance the relationship between the University of Florida, its alumni, students and friends; and to support the university's mission of teaching, research, and service. Our members hail from Okaloosa and Walton counties which include the cities of Fort Walton Beach, Niceville, Destin, Crestview, and the Beaches of 30-A. The Emerald Coast Gator Club is an affiliated organization of the UF Alumni Association (UFAA). The Emerald Coast Gator Club watches games at Harry T's on the Destin Harbor. This is also where we hold meetings, host guest speakers, and have fund-raising events. Harry T's has quite possibly the most scenic view you will ever find. It also has a huge drink selection, TV's everywhere, and is located at the heart of Destin's HarborWalk. We meet regularly to watch sporting events as a group and we also get together for community-service activities. From time to time we host special guests and receive information regarding the University of Florida. Coaches, sports writers, and famous alumni periodically visit our area and often will serve as speakers for ECGC events. Last year we travelled together to watch a UF baseball game in Pensacola, and many members of our group volunteer time with "International Gator Day", and other activities. During all of this we raise funds to provide scholarships to local students that attend UF. For the 2015/2016 academic year, we awarded $10,000 in scholarships for incoming freshman. The Emerald Coast Gator Club watches games at Harry T's on the Destin Harbor. This is also where we hold meetings, host guest speakers, and have fund-raising events. The viewing parties are open to everyone, not only ECGC members. Everyone is welcome to come out and enjoy the games with us. We often host guest speakers that come to town to update the public on the latest happenings at UF. Our most regular guest is Pat Dooley, head sportswriter for the Gainesville Sun. Pat visits each summer and always has great insight into Gator Athletics. Every couple of years or so we also are able to host coaches from UF as they travel across the state promoting the University. In addition to sports writers and coaches, we have also been known to be visited by Danny Wuerffel and a few other local celebrities. The Emerald Coast Gator Club will hold its first ever annual reception for local students that have been admitted to UF in the Spring of 2016. (Date and Location TBD). We understand that the transition from high school to college can be challenging for both students and their families. There are always questions and concerns to go along with the excitement and fun of joining 50+ thousand other students. To assist with these challenges the Emerald Coast Gator Club will conduct a reception for all high school students from Okaloosa and Walton counties that are accepted into UF for the 2016/2017 academic year. We plan to invite current students, professors, and members of the University Alumni Association (UFAA) to attend. These guests, along with members of the ECGC, will be available to answer questions and provide information based on our experiences in Gainesville. Also, during the reception the ECGC will explain the scholarship evaluation process and provide more information about how the ECGC interacts with the Emerald Coast community. In recent years the ECGC has had the priviledge of presenting scholarships at various high school awards ceremonies. Officers in our club have been able to award scholarships and recognize the recipients in a public setting. Its an honor to stand in front of several hundred students, parents, and school administrators and praise the young men and women that have earned acceptance into UF and have been selected as winners of the ECGC scholarship. The Emerald Coast Gator Club and its supporters take pride knowing that their donations support local students attending the University of Florida. And the students that are awarded scholarships by the ECGC should also be proud of their academic and civic accomplishments in high school. To recognize both the students and their supporters, we host a scholarship awards ceremony each summer. We invite scholarship recipients and their families to be recognized for their hard work and acheivments. We take pride in the natural beauty of the Emerald Coast, but we are also proud to be part of a community that knows how to 'give back'. The ECGC regularly takes part in activites that benefit our local area. We have supported Wounded Warriors, Toys-for-Tots, and International Gator Day. This year we plan to assist with the first annual Destin marathon and a variety of other activities that support our area. The best way to stay in touch with club members, learn about upcoming events, and share photos is by joining the Emerald Coast Gator Club group on Facebook. Just click this link and join the group. The Emerald Coast Gator Club has an active email distribution. However we are not yet configured to accept automated subscription requests at this time. Until the automated system is in place, please contact one of the ECGC officers and request to be added to the list. The Gator Club network has always served as the University of Florida's local representative as an affiliated organization of the UF Alumni Association. Membership in the UF Alumni Association is your direct link to Gator Nation. Not only does it allow you to outwardly demonstrate your Gator pride, but there are exclusive benefits just for members. Additionally, your membership dues directly support student scholarships, alumni programming, and the University of Florida. Whether you are an alumnus, parent, or a friend, you can join the UF Alumni Association. Membership in the UF Alumni Association and the Emerald Coast Gator Club is open to alumni, students and friends. All current members of the UF Alumni Association are automatically enrolled into the local Gator Club . To find out more information on the Gator Club network go to http://connect.ufalumni.ufl.edu/network/gatorclubs. For additional information regarding the combined dues program please contact the UF Alumni Association at 888-352-5866 or ufalum@uff.ufl.edu. The ECGC scholarships are awarded based on a wide variety of criteria. We take into account the student's GPA, the difficulty of their curriculum, their college entrance exam scores, and their place in their graduating class. In addition to course work, we also evaulate each student's work history, any community service performed, and extra-curricular activities. Finally we ask each applicant to write a brief paper that explains their goals for their future. Each member of the scholarship committee evaulates each and every application individually, then the committee meets (sometimes more than once) to discuss applicants and decide on a ranking for each. Depending on how well the club performed financially, we determine how many scholarships we can afford and then award them to the top applicants. For the 2016/2017 academic year the Emerald Coast Gator Club was again able to award 5 scholarships valued at $2,000 each to students from Okaloosa and Walton Counties. This is the second year in a row that the club awarded $10,000 in scholarships. Scholarship applications for 2019 can be downloaded in either MS Word or PDF Format. We have several committees that provide focused support throughtout the year. The following are the leads for each committee. Original, custom T-shirts are for sale. They are high-quality, all cotton shirts, with a one-of-a-kind image on both the front and back. We have both long- and short-sleeve shirts available. 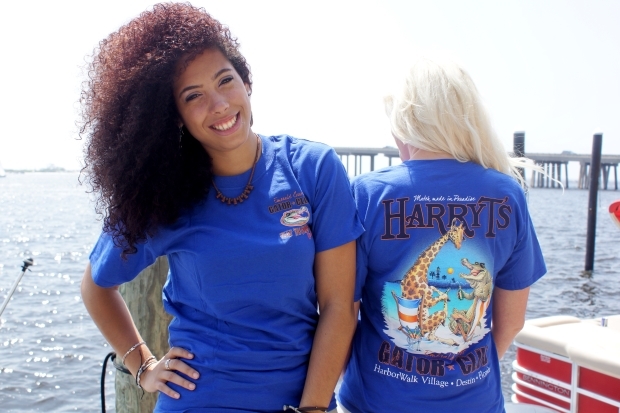 Harry T's in Destin is providing storage and handling for the club and is the most convenient way to purchase the shirts. Certain club officers also have a supply of shirts for distribution in the Niceville and Fort Walton areas. Contact Mike Coupe or Steve Caldarelli to arrange to pick up your shirts in those areas. T-shirt sales is the primary way that the Emerald Coast Gator Club funds scholarships, so once you've bought a few for yourself, pass the word to your friends and neighbors and help us to help local families send their kids to UF. There are many examples of traditions that build camaraderie in the military, but few are as well-respected as the practice of carrying a challenge coin�a small medallion or token that signifies a person is a member of an organization. It's nearly impossible to definitively know why and where the tradition of challenge coins began. Stories say that �The Challenge� began in Germany after World War II. Americans stationed there took up the local tradition of conducting �pfennig checks�. The pfennig was the lowest denomination of coin in Germany, and if you didn�t have one when a check was called, you were stuck buying the beers. If all the other members had their medallions, the challenger had to buy everyone drinks. Challenge coins are now being used by many different organizations. In the federal government, everyone from Secret Service agents to White House staff to the President's personal valets have their own coins. Probably the coolest coins are those for White House Military Aides�the people who carry the atomic football�whose coins are, naturally, in the shape of a football. Today, it�s not uncommon for police and fire departments to have coins, as do many civic organizations, such as the Lions Club and the Boy Scouts. Even Harley Davidson riders and Linux users have their own coins. Challenge coins have become a long-lasting, highly-collectible way to show your allegiance anytime, anyplace. Each coin is uniquely numbered and the quantities are limited. They will be available for sale at a cost of $20 per coin during our Game Viewing events at Harry T's on the Destin Harbor. Come show your support for the Gators and watch the Peach Bowl at Harry T's! When: Saturday, December 29th at 11:00 AM CST.